Banished from Constantinople through the instigation of his enemies St. John Chrysostom had arrived in Cucusus in the autumn. He survived the hardship of travel and an illness along the way as well as the winter. After this came the marauding raids of the Isaurians followed by the intense heat of the summer. After a year in Cucusus he was obliged to leave the city, and he went to Arabissus whose bishop he knew. There he experienced again the rigor of winter and fell ill a second time. With the people of the town he endured famine and the constant raids of the Isaurians. From letters to his friends it is known that he spent the second year of exile in Arabissus (406 AD), and before the year was over returned to Cucusus where he suffered through a third winter in exile; it was the year 407 AD. His enemies had wished him to die at Cucusus but since he had survived they had him banished to an even more inhospitable region undergoing the extenuating hardship of the journey in very bad weather and long marches on foot. “He was to die by inches; want of sleep, want of rest, want of food and medicine, and the collapse certain to follow, were to extinguish the brave spirit which hitherto had risen superior to all sorrows.” Obtaining an order from Emperor Arcadius he was exiled to Pityus on the north-east coast of the Euxine (the Black Sea). Here as Newman put it the curtain falls upon the history of our saint because his letters cease and we have no further news of him. It is not known which of three possible routes he took on his way to Pityus, but without reaching his destination after three months of journeying he died at Comana in Pontus on September 14, 407. From thence some thirty years later his sacred remains were transferred to Constantinople. 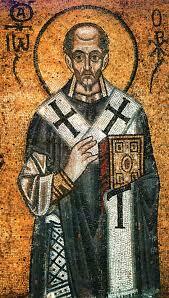 St. John Chrysostom expounded on the literal sense of the Scriptures in contrast to the mystical. Others had done this before him, but he excelled in this with “his habit and his power of throwing himself into the minds of others, of imagining with exactness and with sympathy circumstances or scenes which were not before him, and of bringing out what he has apprehended in words as direct and vivid as the apprehension.” He looked “with sharp but kind eyes upon the world of men and their history” and thus his writing has an appeal and intimacy that others’ do not have. Centuries later it is said that when St. Thomas Aquinas was arriving at Paris to a gathering with St. Louis, King of France, he was shown the beautiful view of the city from a hilltop, and he remarked that he would rather have a manuscript of Chrysostom’s that he was unable to obtain. A great 20th century saint, Josemaría Escrivá often quoted Chrysostom for his very vivid and dow- to- earth descriptions and application of the Gospel teaching. We too have much to love and admire in the Chrysostom’s commentaries on Scripture, his understanding of friendship, his practice of charity and his affable and warm Christian spirit. And in his exile and death we have a worthy example of Christian forgiveness and endurance.